Keep bike parking neat and orderly. Inspired by the common rolling-wave style bike rack design, the Hi Roller raises the frame posts and angles the rolling-wave parking slots. 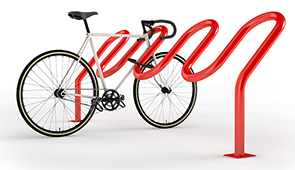 The innovative modifications featured on the Hi Roller bike rack, helps prevent the potential domino effect and cluttered bike racks. It's unique, angled design creates a hip aesthetic and allows the ability for dual-side bike entry, providing sufficient, secure parking for up to 8 bicycles. Constructed with large 2.375"O.D. schedule 40 steel tubing, the commercial grade Hi Roller bike rack is great for business exteriors, parks, schools and universities. 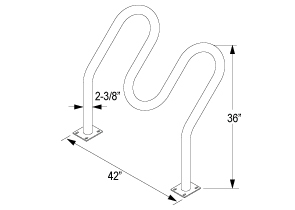 This all-steel Hi Roller bike rack can be installed as in-ground or surface mount and available in galvanized or powder-coated finishes.